Therefore, USS JUNEAU (LPD 10) is an “amphibious transport dock” and USS RUSSELL (DDG 59) is a “guided-missile destroyer”. Now, a ship’s type is not to be confused with “class”. Ship types are created to describe a ship’s function, while the class of a ship gets its name from the lead ship that was built upon a particular design. 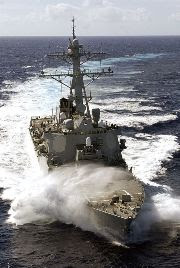 For RUSSELL, though our ship’s type is a “DDG”, our class is Arleigh Burke, so named after the lead ship, USS ARLEIGH BURKE (DDG 51). Usually, the numbers are merely sequential in a type, with each new class beginning where the last one left off. Sometimes, however, the expectation that senior leaders be innovative mixes with the previously noted adherence to tradition and produces a volatile brew of institutional schizophrenia. One symptom of this potentially toxic mix might be that the Navy just starts over. For instance, USS GYATT (DDG-1) began life as USS GYATT (DDG-712). In the case of the GYATT, Big Navy just decided that the modifications were so advanced that she was the starting point of a new type. Another symptom is the case of the soon-to-be commissioned USS FREEDOM (LCS 1), which was given its type designation without regard to any system. What does LCS stand for, you ask? “Littoral Combat Ship”, which is exactly what it does. LCS must be the only place they tried to save money on that gold planted camel. Sir the type letter T stands of transportation as in Military Sea Transportation Service, now Military Sealift Command. T predeces ALL Navy owned ships operated by MSC and NOT just auxiliaries of the Naval Fleet Auxiliary Force, T is also for ships in strategic sealift and tactical transport roles. Those ships can be crewed by either CIVMARs or commercial merchant mariners.